Noosa Sound House by Bark Design Architects. Noosa Sound House is located in Noosa, Queensland, Australia, and was renovated by Bark Design Architects. The transformation of the Noosa River House started with an eighties palette of speculative brick and tile, large footprint house, built to the allowable setbacks. 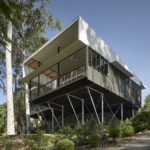 This entry was posted in house, kitchen, living, loft, outdoor, terrace and tagged Australia, Bark Design Architects, beach house, house, house idea, houseidea, kitchen, living, myhouseidea, Noosa, Noosa Sound House, outdoor, Queensland, terrace, villa on November 10, 2013 by admin.